One, there is no substitute to hard work, and two, be the change you want to see. Lead by example. Pallavi Mahajan, vice president of engineering for Juniper’s Junos Software, is responsible for driving strategy and execution for all engineering functions. During her tenure, Mahajan has served Juniper in a number of roles, including defining and leading the company’s Software Automation and Programmability story and global engineering teams. 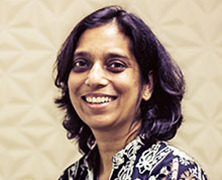 As a member of Juniper Networks India founding engineering team, she was credited with incubating numerous new software teams in Juniper, India. Her technical and leadership contributions include many successful products and the filing of eight patent applications, six of which have been granted. However, she is more than a leader, she is also an inspiration. Mahajan is a mentor for women engineers inside and outside Juniper. She empowers women and girls by involving herself in organizations that help motivate young girls to continue their education in science, technology, engineering and mathematics (STEM) fields. Active in philanthropy. Mahajan leads the Juniper Corporate Social Responsibility (CSR) charter in India, which has adopted a village cluster, focusing on education and health, while empowering the female population. She also assembled a group of colleagues to determine the needs of rural Indian villages and improve living standards. Leadership has been a journey for Mahajan. She says that there was no one defining moment, but rather a series of opportunities to be seized. “From picking up projects without being assigned, to always looking ahead and being in a constant learning mode, looking to see where the industry is trending and staying ahead of those trends, to defining areas where I could make meaningful difference to the society, that has been my journey,” she reflects. Mahajan tells mentees that they get to make their own choices. “Some of us want to prioritize our careers, some want to pursue other passions and some, families. In the end, whatever our choice, we should be proud of it and not compare ourselves with others. Nothing comes for free, and there will always be tough moments and times when you will want to call it quits. In those times, always remember that the world is full of good people, all you need is to stretch out your hand and ask for help,” she coaches.